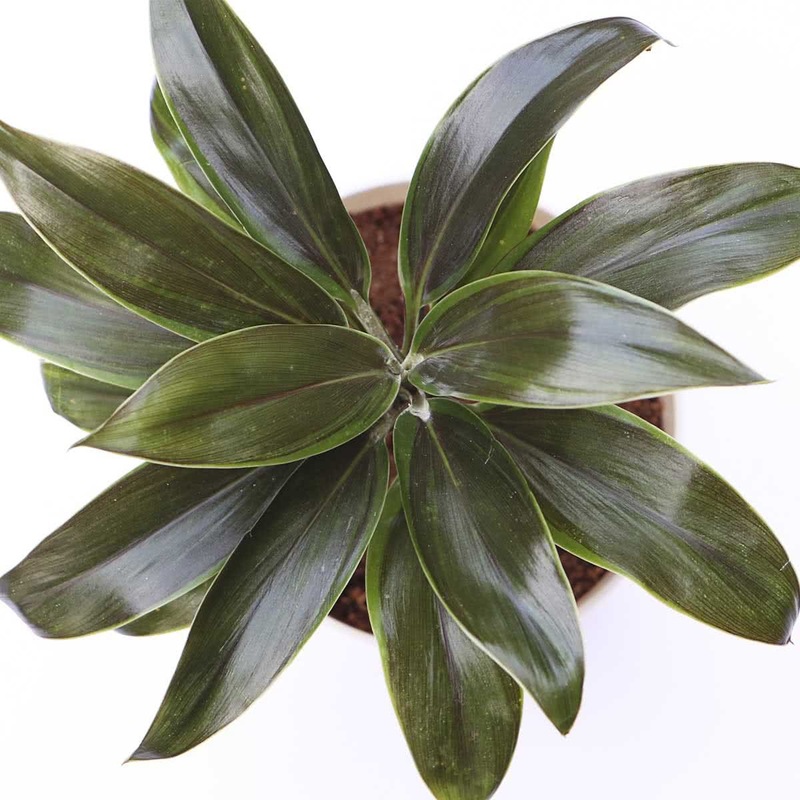 Plant Description: Dracaena coffee is an excellent dwarf plant with narrow, concave, gracefully recurved leaves. Its deep metallic green foliage grows with a red venation. Its leaves develop rich coffee brown color when exposed to sunlight. Suitable for both outdoor and indoor arrangement Dracaena coffee is an ideal plant for containers. Plant type: Ornamental foliage plant. Growth Habit: Palm/Bamboo like shrub. Growth Rate: Dracaena Coffee is a slow growing and straight growing plant. Average Landscape Size: Small shrub when grown as houseplant in a pot (2-5 ft). 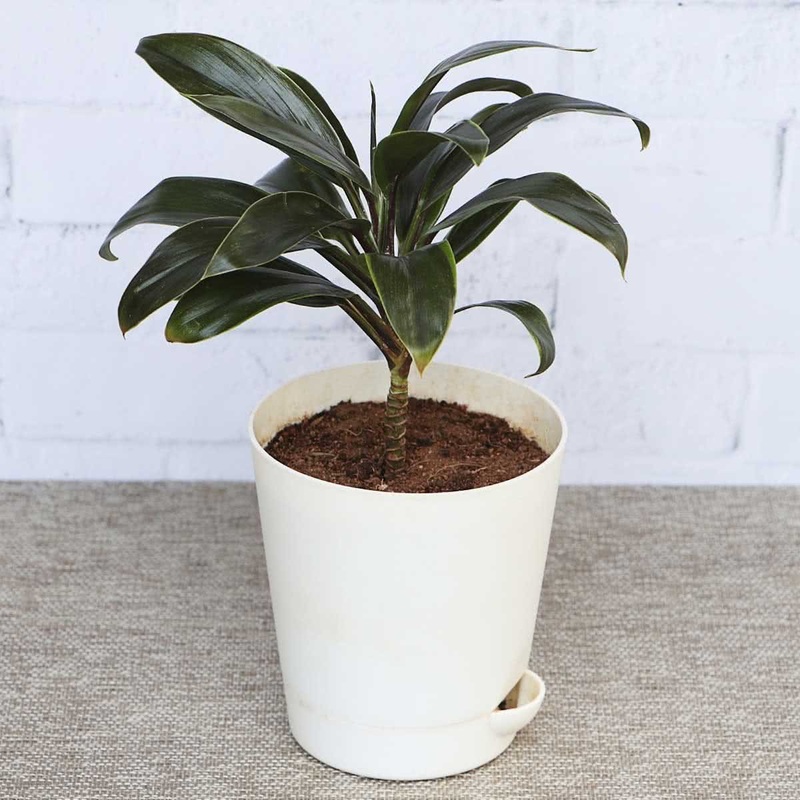 Special Features: Dracaena Coffee is air purifying plant and a good luck plant. Soil: Dracaena Coffee prefers well-drained soil, rich in organic matter. Any good quality pot-o-mix available for houseplants will be beneficial for the plant. Pot Size: 12-16 inch, round pots. Pot could be made up of plastic, fibre, ceramic or terracotta. The plant prefers pot bound conditions. Potting/Transplanting: The pot selected must have proper drainage holes. To prevent water clogging, cover the drainage holes with broken pieces of earthen pots or brick pieces before putting the soil. Transplant the Dracaena sapling in a pot along with root-ball of the original soil. Carefully place the plant in the middle of the pot & cover the roots completely with remaining soil. 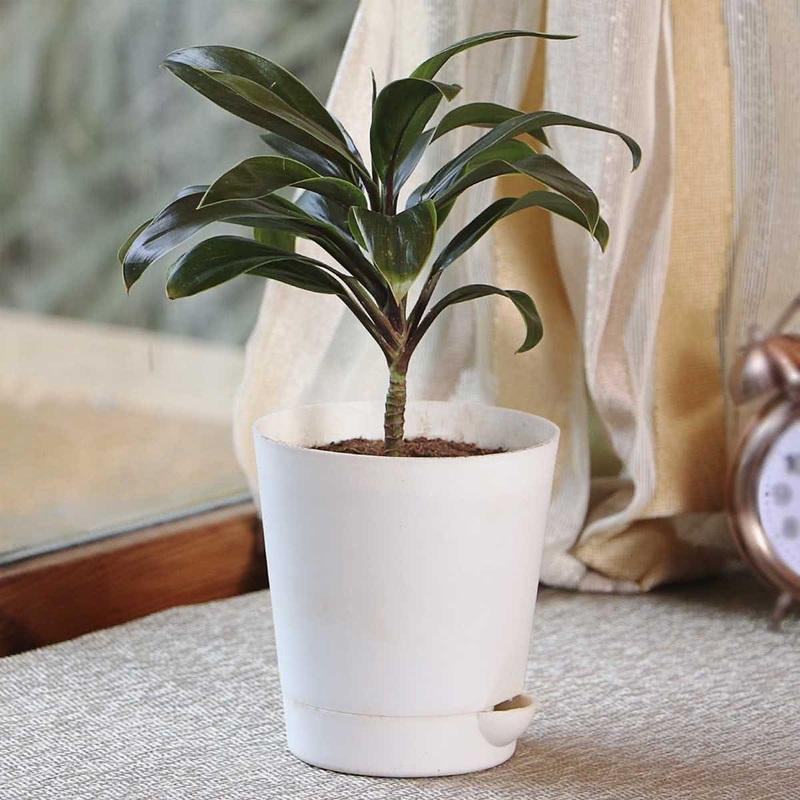 Repotting: Repotting of Dracaena Coffee plant should be done every year; especially when the plant has grown too tall, has become extra root bound, oversized as compared to the old pot. Sunlight: Dracaena Coffee needs plenty of diffused sunlight. You need to provide good light (2-3 hours) when indoors to maintain foliage color. Plants don't mind low light conditions. However, do not keep the plant under direct sunlight in summers. Water: Dracaena Coffee needs sufficient water supply. Allow the plant to dry slightly between watering. Wait until the soil surface is dry when touched, and then water them thoroughly. Avoid watering with cold water. Spraying clear water on the foliage is beneficial for the Dracaena Coffee plant. Fertiliser: Dracaena Coffee likes rich compost mixed with little limestone powder, which promotes the color development. Temperature: Dracaena Coffee grows best in 20-30 degree Celsius during the day. They can tolerate low temperatures too. Humidity: Dracaena Coffee grows well in hot & humid climate; however it can also tolerate conditions with low humidity. Plants will profit from an occasional misting of their foliage. Pruning: The leggy leafless old plants should be cut back near the bottom to encourage new growth. Propagation: Dracaena Coffee can be propagated by air layering or nodal/ terminal cuttings of canes. Companion Plants: Aralia, Dieffenbachia, Money plant, Philodendron, Ferns. Coffee brown coloured erect stems & leaves. Fine texture. Sometimes used for outdoor edging. I should appreciate Ugaoo for delivering me A healthy plant with good roots and looked exactly as in the picture.